This article was published in collaboration with AlterNet and originally appeared here. As of midnight, it became legal to possess, grow, and consume small amounts of marijuana in the nation's capital. 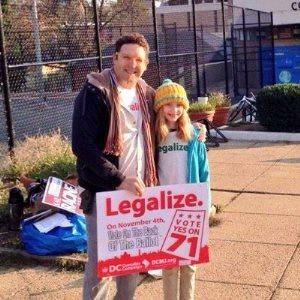 An initiative passed with the support of 70% of DC voters has now gone into effect. Republicans' efforts to block the law have been to no avail. Congress passed a budget bill that blocked the District from spending money on easing marijuana laws -- and that has stopped the District council from moving forward with a bill to tax and regulate marijuana commerce -- but that came after voters had already approved the ballot measure, Initiative 71. Though some Republicans have cried foul, DC interpreted that timing as meaning that the initiative would take effect. After the 30 legislative days Congress had to act to block the initiative ran out (after DC officially forwarded the November election result to Congress), Congress had 30 days to act to block the legalization it. It failed to do so, and the 30-day period ends today. Absent a court ruling to the contrary, the initiative is law. District officials, from Mayor Muriel Bowser to Police Chief Cathy Lanier, have signaled that they intend to heed the will of the voters. "DC residents spoke loud and clear," Bowser said at an event Tuesday with the council where she and other city leaders vowed to carry out the new law. The city has even produced a Q & A pamphlet that seeks to clarify exactly what is and is not allowed under Initiative 71. That is particularly useful because this is legalization with some caveats. Adults 21 and over can possess up to two ounces of marijuana and grow up to six plants in their homes, of which no more than three can be flowering. They can also give (but not sell) up to an ounce to other adults. But there is no public consumption allowed, and there is no provision for taxed and regulated marijuana sales. There will be no legalized pot shops in DC -- at least for now -- although existing dispensaries will continue to operate to serve the medicinal market. Anyone convicted of smoking or consuming marijuana in public faces a $500 fine and up to 60 days jail time. Selling marijuana carries a $1,000 fine and six months jail time. And any business that lets patrons use pot could lose its license. And the DC law doesn't apply on federal property. This is significant because 22% of the District is federal property. If you are caught with marijuana on the Mall or the Jefferson Memorial, for example, you can face federal marijuana charges. 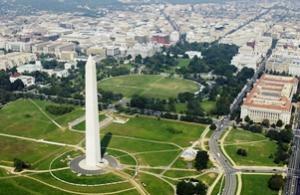 DC now joins Alaska, Colorado, and Washington in having marijuana legalization in effect. In Oregon, where residents also voted to legalize it last November, the new law goes into effect on July 1. 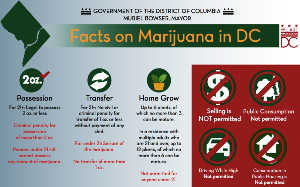 "The sky isn't going to fall," predicted Michael Collins, policy manager for the Drug Policy Alliance national affairs office, which worked closely with the DC Cannabis Campaign, the group that sponsored Initiative 71. "But there will be some confusion about what this means. It's going to be very similar to other states that have legalized or are in the process. In those states, legalization went into effect and they didn't have tax and regulate for months, and there wasn't any chaos. There won't be any chaos here, either." "I feel good," said long-time activist Adam Eidinger, the driving force behind Initiative 71. "I've stopped pinching myself." Still, Eidinger said, he had nothing special planned to mark the day. "We'll plant some seeds, that's about it," he said. He has certainly planted the seed of marijuana legalization in the nation's capital, but there is more to be done, he said, pointing to the huge racial imbalance in DC marijuana arrests. Blacks accounted for 91% of all marijuana arrests in the city and were arrested at a rate eight times that of whites. Anger over the disparate enforcement of the pot laws was key to winning the initiative. Multiple civil rights, faith, and community advocacy groups campaigned for Initiative 71, seeing it as an opportunity to redress racial injustice. "Marijuana has been effectively legal in the affluent and white parts of the District west of 16th Street for years," said Bill Piper, head of the Drug Policy Alliance's national office. "All Initiative 71 does is treat the black community the same way -- no arrests for minor marijuana violations." But without full legalization, Eidinger said, racially-biased enforcement will continue. "Home cultivation and possession begin to address the racial justice end of this, but that will not be fully addressed until we have in-store sales," Eidinger said. "We will still have people selling marijuana illegally." The experience has also reawakened the DC political gadfly's long-standing interest in home rule for the District. "I've been very disturbed by the way Congress has been treating residents of the capital," he said. "The whole effort to overturn the initiative really opened my ears to how once and for all we have to have equal rights as a state. We're planning a big push for home rule in the spring. That would benefit marijuana, too." But as earth-shaking as marijuana legalization in the shadow of the Capitol is, what is equally striking is the inability of Republican conservatives to stop it. "The big story is not that DC legalized it," said Collins, "but that the Republicans couldn't stop this. They had 30 days to review this, they had the opportunity to hold a quick up and down vote, and they chose not to. The Republicans are split on this issue. A lot of them support marijuana reforms, and many more are not interested in being the anti-marijuana party." "There is simply no organized, significant group of members of Congress willing to waste time fighting against marijuana legalization, an issue that has become extremely popular with voters everywhere," added Piper. "The Republican House voted five times last year to let states set their own marijuana policies. And the recent scandal over DNC chair Debbie Wasserman Schultz shows that it is opposition to marijuana reform that is now politically toxic." Now, the fight will turn to whether and how the District can move forward with taxation, regulation, and marijuana commerce. While some will be toking up in DC tonight, the battle is only half over. NOW CONGRESS CAN GET HIGH, BUT NOT IN THEIR STATE.